If you are considering going to Australia to work or need to do your regional/agricultural work for your second year working holiday visa – working within the pearling industry in the country's Western region might be exactly the job for you. “Pearling” is not extracting the pearls from the shells themselves but hacking the deposits that have formed on the clam shell over time. In most pearl farms, clams take around eight months to produce a good sized pearl. The job of pearling is to rid the clam of impurities and to look out for potential diseases that may stop or slow down the formation of the pearl inside. 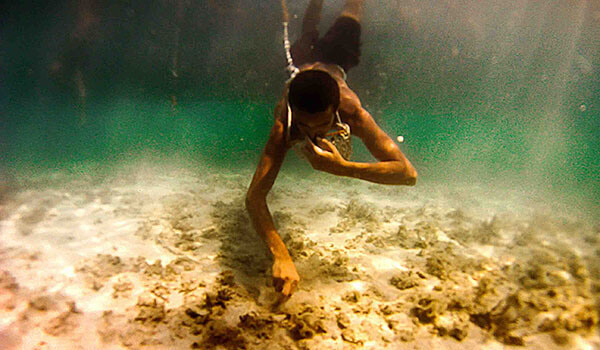 Once it has reached maturity, divers who are properly trained in pearl harvesting, retrieve the clams and place them back ready for their next season. Broome in Western Australia is a great place to start looking as it has the highest concentration of pearl farms than anywhere else in the country. You can also find pearling jobs in the Northern Territory and Queensland too. Most places will take on people with little experience as it is a relatively easy job but one that is long hours and repetitive tasks, on hundreds of clams a day. You also have to stay on a boat out at sea for 2 weeks straight so some may not be able to cope with being away from civilization for that long a time. The work pattern for most jobs is 2 weeks working and 1 week off, so it’s entirely depends on if you think you’d be suited to the working life of a pearler. Obviously the pay is a huge draw for people, which come in averagely at $1,000 a week. Although this may seem moderate by Australian wage levels, all your accommodation and food are paid for and there is nothing to spend your money on whilst out at sea for the 2 weeks. For backpackers wanting to save cash quickly to fund their trip, this can be a great way to do just that, without the temptation of spending that hard earned cash away. Plus, although it is a simple yet repetitive job many people say pearling is easier than most of the agricultural work many do in order to obtain a second year visa. Plus you’ll get to swim and free dive every day whilst out at sea – which may appeal to you more than toiling in the fields in the hot sun all day! If you do start pearling in Broome, you may here the myth that a worker there when harvesting pearls one season, stole a very big and particularly beautiful pearl. Apparently one of the other divers on the team saw the event and killed the man to obtain the pearl for himself. The legend goes that the same fate became of each person that tried to keep the pearl, but over the years no one actually knows what became of the pearl itself. If you spot aforementioned pearl – I’d just give it away to a museum and break the curse once and for all! Last updated by jack on 09 July, 2014 in Travel.